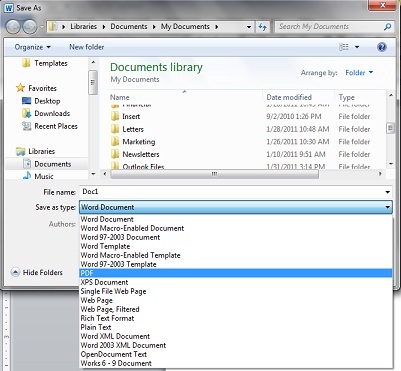 Create a PDF Document in Office 2010 - It's Easy! Here's a tip to get more from the small business technology you already have. One of the helpful features in Office 2010 is the ability to directly create a PDF document by using the "save as PDF" feature. Instead of relying on a third-party application, the capability is built right in. PDF stands for Portable Document Format, and this means anyone can view your file and keep the formatting intact, even if they don't have Microsoft Word on their system. This feature is also built into PowerPoint, so this makes it easy to share your presentations over the web. Note that you also have the option to save your file in an older version of Microsoft Word (Word 97-2003), so you don't need to worry about file compatibility if you're using different versions in your small business. We always advise clients to take a few moments to learn more about the technology you have, because you probably have more than you know. Getting your eMail Through Spam Filters. A customer contacted us a few days ago with an email dilemma. They had been receiving a valued daily report through email, and all of a sudden they stopped receiving it and found that it was in their spam filter and wondered why. After taking a look at it, it turns out that the sender had changed their "from" address for their bulk email. Just about all bulk mail (spam if you don't want it, bulk mail if you do), will get flagged by spam filters. The recipient had already "safe listed" the old address, but with the new address, it was getting stopped again. This was easily fixed by updating the safe sender list to include the new address. In your own small business, if you send out a newsletter or other sort of daily, weekly, or monthly update, keep in mind that many of your recipients may find it valuable and want to receive it, but spam filters may stop it. Think carefully before changing your "from" address, because many of your recipients may stop receiving it if you do! The Billion Dollar Lost-Laptop Study - Protect your Small Business! The "Billion Dollar Lost-Laptop Study" conducted by Intel and the Ponemon institute, reports that more than 300 businesses lost more than 86,000 businesses last year worth a staggering $2.1B. While 46 percent of the lost laptops contained confidential information, only 30% of those systems were encrypted. With the new MA Data Protection Law which went into effect March 1, 2010, any personal information stored on a laptop requires encryption. If you're not already compliant with the new law, make it a New Years resolution to get your company laptops encrypted. A recent article in Inc Magazine covers "What to do when you lose your computer" - must-reading for you and your employees. Proactively encrypting your systems is the BEST protection against loss or theft, and keep in mind that if you carry protected personal information on any MA resident, you would be breaking the law without encryption. Going Paperless for our Small Business - The next step - shredding! With our file cabinets so full we could barely squeeze in another piece of paper, it was time to shred! Our process is already in place going forward to keep paper away, but there still was the 800-lb gorilla of the full file cabinet to deal with. We called DataShredder (www.DataShredder.net) to come on site to deal with task. A few days before our scheduled date, we went through the files to pull items we already had electronic copies of, mostly customer invoices, but also many vendor invoices as well. We filled several bins, and on the big day, DataShredder brought their truck to our parking lot, and we could actually watch our old information get shredded on a video monitor. All the shredded paper will be recycled, and we're not generating more of it! We received a certificate of destruction - paper copy, needs to be scanned and shredded :). Our data back-up process has been tested, and we're ready for the New Year!